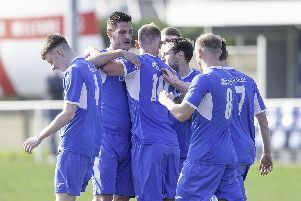 Frickley Athletic manager Martin McIntosh is pleased with the way the new players he has brought into the club in recent weeks are fitting in. It was one of the old guard in Jacob Hazel who took many of the plaudits with a man of the match display and both the goals in a 2-1 win at Sheffield FC last Saturday. But the Blues had five recent recruits in their starting line-up and all played their part in getting the team back to winning ways in the Evo-Stik East Division. “It’s been difficult for us in the last two or three games. We’ve had six new players and it’s really tough to have these players gel into the team,” said Frickley boss McIntosh. “But some of them have fitted in very, very quickly and I think that’s due to Greg Young, Jamie McGuire and Jacob Hazel and so on, the experienced players who have helped them. It was a good win against top five play-off contenders and Mcintosh was understandably pleased with his team’s display. He added: “I’m delighted with the result. It was a difficult game, Sheffield are on a high, but I thought the lads dug in really well and put in a performance that we’re all proud of. “Jacob Hazel’s two finishes were out of this world. The second goal to see that come out of the air and catch that on the volley the way he did was a bit special. McIntosh is keen for Frickley to finish as high up the table as they can, but despite the win and four points from their last two matches they still remain in 12th place. They will be looking to finally climb the table this Saturday when at home to second from bottom Carlton Town, but will not be taking anything for granted with the visitors scrapping for their lives to stay in the league. A poor run of four straight league defeats has left Carlton in a precarious position and they already have a defeat against Frickley this season with the Blues winning 2-1 away to them back in September when Jameel Ible and Gavin Allott, with a penalty, clinched victory in an eventful game in which goalkeeper Hugo Warhurst got injured and on-loan striker James Morris played for an hour as a stand-in stopper.